“Pud” Sam Stoltzfus is a retired Amish farmer and gazebo builder known throughout the Lancaster County community for his outspoken nature. He has been a frequent writer of letters to the local Lancaster paper, an impromptu spokesman for the Amish in some sense. If you get a chance to meet him, you probably won’t forget it. Pud Sam is a historian, grandfather to 51, and horseradish seller to boot.
. I was happy to see that he has put his thoughts into book form, and judging by the chapter titles there are a lot of interesting topics. While I haven’t dug in too deep yet (stay tuned for more when I do), Lancaster Online’s Scribbler Jack Brubaker has written a bit on his book, and the story of supervised youth groups in Lancaster County, which Sam details. Supervised youth activities were once not the norm in Lancaster County. But a dramatic event in 1998 set the community on a different course. 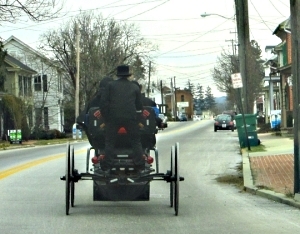 Rowdy Amish teens have caused problems during Rumspringa. Following a highly publicized but limited episode of drug dealing in 1998, two Amish bishops joined parents in discussing whether gatherings of teenagers should be supervised. 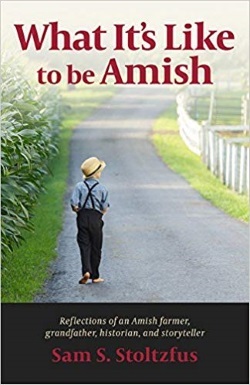 That was the beginning of the first authorized Amish youth groups in Lancaster County. In early 1999, Amish bishops and parents approved and printed guidelines for a new youth group called the Eagles, according to Stoltzfus. Some parents thought their teens should dress more conservatively than Eagles and developed their own group called the Hummingbirds. Both groups abandoned Saturday evening gatherings and embraced religious singing at Sunday evening events, which had to end at 10. However, some parents thought this approach was not conservative enough and, in 2002, began a third group called the Parakeets. Hundreds of Amish teens joined these three groups, which later split into smaller groups. All of the groups used the same basic guidelines, with adult supervision. Friction continues with dress codes and the question of open versus closed buggies. Despite occasional problems, supervised youth groups have provided “many blessings,” Stoltzfus says. He cites two examples: Young women in supervised groups make better schoolteachers; the young men make better church leaders. There would be no Saturday evening gatherings. Sunday gatherings for supper and evening singing would take place at the same home. This eliminated large groups of buggies on the road at one time. Singings would start at 7:00 p.m. using the Ausbund hymnal for one hour, followed by singing from the Unpartheyisches Gesangbuch for one hour. A light snack would be served, with no outside activities. Everyone must leave by 10:00 p.m. I have had a chance to attend several of these singings in Lancaster County. Here is my full account of a Parakeets singing, and here’s a brief comparison showing differences with an Eagles singing. I don’t know about that “no outside activities” stipulation above; nowadays at these singings games like volleyball are typically played. This singing was rather different from others I’d attended of the more traditional Parakeets youth group. Singing was closer to an hour and fifteen minutes (though I’m told it’s usually about an hour and a half) versus two hours in the Parakeets’ case. Singing was also faster and done in four parts; the Ausbund was used along with a second hymnbook, though English choruses were often inserted. This group was a good bit chattier during the singing as well. The Eagles, at least at the time, were the largest group, with seven sub-groups. As the groups have grown, they have divided, and in some cases, completely new groups have been formed. Not everyone agrees with how the groups are to be run. Are these supervised singings unique to the Lancaster area, or do other Old Order groups have them? Good question Helen, other Old Order groups have them as well. In Holmes County for instance there has been a similar emphasis on “cleaner” youth gatherings. Ironically it’s sometimes among the most materially traditional groups where you’ll see the wildest behavior. Some communities also have worse reputations for that sort of thing than others. Hi my name is Frank and this summer I had the unique privilege of meeting a Sam Stoltzfus while looking for a long lost friend. Trying to find out if this is the same. He did make furniture and horseradish. If horseradish was involved, this would probably be the same Sam. He lives in Gordonville in Lancaster County, and would be in his 70s.